DIRECT GAS FIRED / INDIRECT RADIANT is a suitable combination oven for products such as crackers, hard sweet biscuits, soft dough biscuits. Products, such as crackers and hard sweet biscuits requiring high heat input in the first part of the baking process to establish good structure and volume are baked effectively by a direct gas fired oven section followed by an indirect radiant oven section. 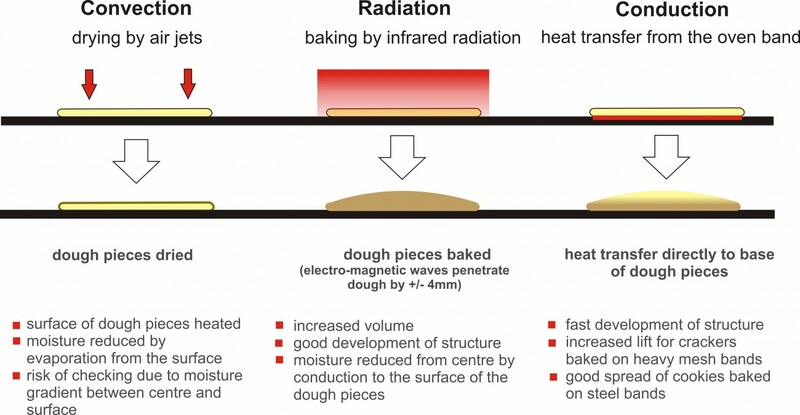 The length of this direct fired section is usually one third of the total length of the oven and the power input of the direct fired section is one half of the total power input of the oven. The indirect radiant oven section will contribute to the optimum development of texture and colour of a wide range of crackers and biscuits.